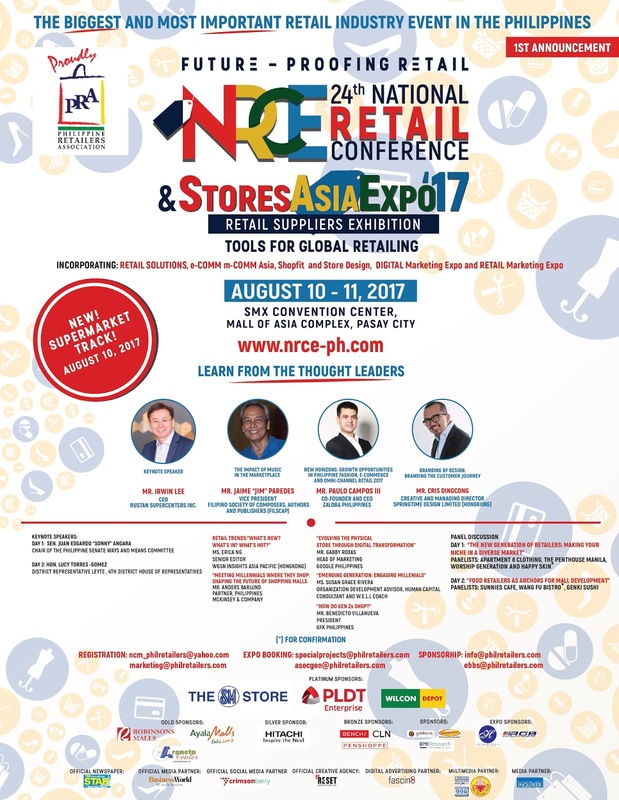 The 24th National Retail Conference and Stores Asia Expo (NRCE) is all set to provide retailers with tips and solutions on how to prepare for the fast-changing digital age with this year’s theme “Future-Proofing Retail.” This project will be staged at the SM Mall of Asia Complex from August 10 to 11. This will be the biggest and most important retail event in the country! The NRCE will feature talks and panel discussions from industry experts and personalities led by Leyte Representative and TV personality Lucy Torres-Gomez, Senator Sonny Angara, and Rustan Supercenters CEO Irwin Lee as keynote speakers for the two-day conference. Topics of the conference will cover new trends in the retailing, branding design, future of shopping malls, creating niche in diverse market, online retailing, fashion retailing, impact of music in the marketplace, food retailing, and engaging the millennial consumers. Confirmed speakers and presenters include FILSCAP Vice president and noted TV personality and musician Jim Paredes, Zalora CEO Paolo Campos, Google Philippines Marketing Manager Gabby Roxas, Springtime Design Limited Creative and Managing Director Chris Dingcong, and Organization Development Advisor Susan Grace Rivera. 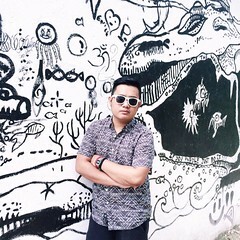 Two panels composed of young and upcoming retailers such as Apartment 8 President Sheira Lim, Sunnies Café Finance Director Eric Dee Jr., and Genki Sushi Owner Eric Teng will discuss the new generation of retailers and food retail as mall anchors. New for this year’s NRCE is the launch of the Supermarket Track dedicated to supermarkets and food retailers which will discuss modern retailing with a responsive Departement of Trade, spatial planning, and supermarket trends in Asia Pacific. Back to back with the conference is the only focused and dedicated retail suppliers’ expo showcasing the “tools for global retailing” from over 100 exhibitors offering products and solutions for the retail industry such as Retail Solutions, E-Commerce & M-Commerce, Shop Fittings & Store Designs, Digital Marketing, Commercial and Real Estate Developers, Web Developers, Non-traditional Advertising, Financial Services, Storage and Distribution, HR Solutions, and Billboard Locations among others. Stores Asia Expo, which is the biggest in the Philippines and is one of the longest running retails suppliers’ expo in Asia, expects to draw more than 3,000 visitors and decision makers from the retail and related industries. The NRCE 2017 is supported by The SM Store, PLDT Alpha, Wilcon Depot as Platinum sponsors; Robinsons Malls, Ayala Malls, Araneta Center Inc. --- Gold; Hitachi Solutions Phils.--- Silver; Bench, Celine, Penshoppe---Bronze; Sportshouse, Shangri0la Plaza, Goldilocks, BMI Research ---Sponsors; Philippine Airline ---- Official carrier; Philippine Star---Official Newspaper; Business World----Official Media partner; ANC----Official Network; Re-set---Official Creative Agency; Crimsonberry---Official Social Media partner; Fascn8---Digital Advertising partner; Talkshop Asia @Radyo Inquirer---Multimedia partner; Philippine Daily Inquirer---Media partner; Rich Brand Graphix, Inc., and Heritage Multi Office Products, Inc. as expo sponsor, and WGSN as session sponsor. For registration, sponsorship, and exhibit inquiries, please contact the PRA Executive Secretariat at 6874180, 6874181, 6874985, or email: marketing@philretailers.com, specialprojects@philretailers.com, or visit www.nrce-ph.com.